This week’s Blast from the Past is one of the only photographs Christine Stacey has of her uncle Herbert Rice. Looking handsome in his military uniform and lopsided cap, Rice is all smiles, truly unaware of what unimaginable horrors were ahead of him overseas. “My uncle Herby was in a death march,” said Stacey. During World War II, German SS guards would force prisoners to evacuate out of one concentration camp into another. Over long distances and harsh climates and terrains, men, women and children would be forced to march for days. If anyone were to fall behind, the guards’ simple solution was to execute. 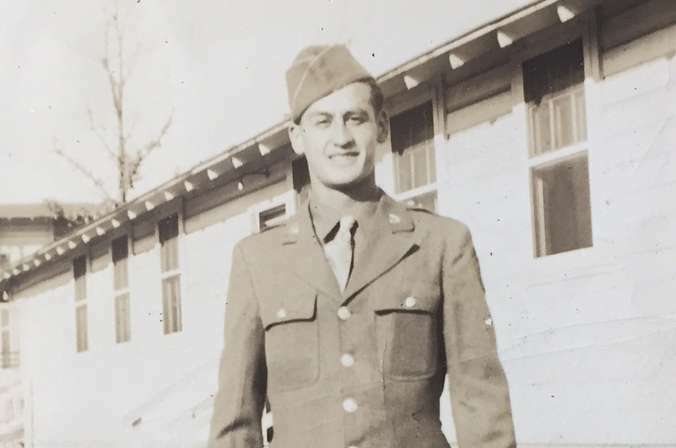 Rice entered service in 1943 and he was captured as a soldier in Germany and was held as a prisoner of war and placed in a concentration camp. “The enemies held guns at them and marched them to a newer concentration camp – a bigger one,” said Stacey. The six-year war ended in 1945, with the Allied troops rescuing all prisoners. Stacey said her uncle survived the march and the war, but was never able to get over what he’d been through after his return. While post-traumatic stress disorder is certainly not uncommon for veterans of the Second World War, Stacey said he was the only one she knew from the family who was ever severely bothered in the aftermath. Rice had three brothers; Pat Stacey (Christine Stacey’s father), Louis “Woody” Stacey and Leonard Rice, who served in the war, while his sister Elda Stacey was employed in the war department. Leonard was killed in combat and buried overseas in Belgium. But Pat, Woody and Elda had all settled down with their partners, with the former two having children of their own as well. After coming back from the war, Rice tried to do the same. He got married to a girl named Millie and they had four children together in Montreal. For her uncle Herby, the drinking was much different. The husband and wife separated and Millie took her four children away to Buffalo, New York, where her in-laws, Herby’s parents, resided. Without Rice, Millie had no choice but to work in order to support and raise her children. She went back to school and became a high school teacher and also worked at a computer company. Rice met his brother Woody’s sister-in-law and the two decided to wed.